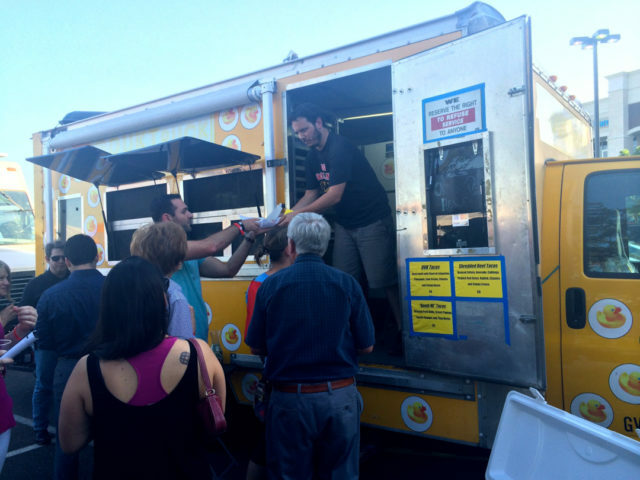 The Culinaria Food Truck Event at the H-E-B Alon Market had it all. 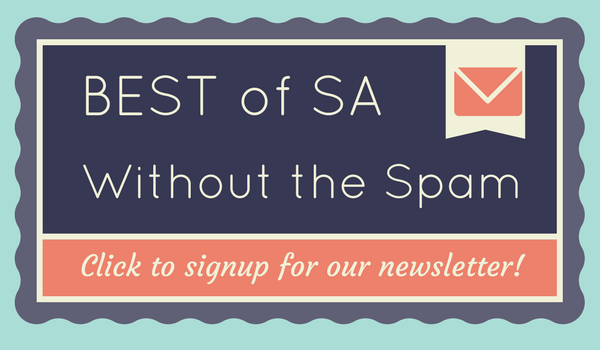 We’re talking truckloads of food, free wine and beer, perfect weather and even a petting zoo. 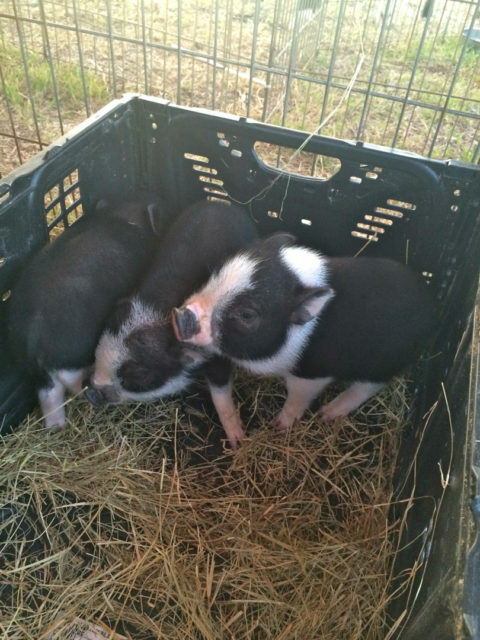 Because who doesn’t want to look at cute little piglets and ponies while they’re chowing down? 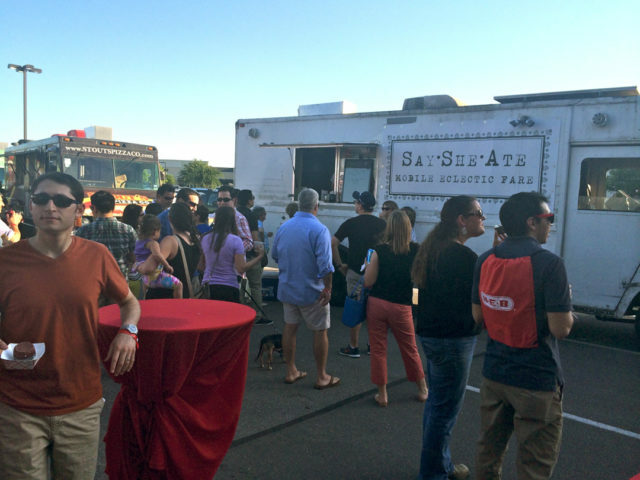 What’s the best part of being surrounded by food trucks? Variety. With everything from tacos and sliders to whoopee pies and lobster rolls, even the pickiest palate could leave satisfied. Now, the worst part of ordering from food trucks, for me? Variety. I simply can’t choose—it’s very stressful. Luckily I brought a few companions who allowed me to take a bite (or two) of their food. Say She Ate drew a large crowd. Photo by Lindsey Craun. We thought it wise to first check out the drink selection before hitting the trucks. H-E-B really stepped up their wine and beer game. Unlike most events that offer just a few wine options, they offered countless wines and a handful of quality beers. I’m already a big fan of H-E-B, but bravo! Drinks in hand, we proceeded to the food. 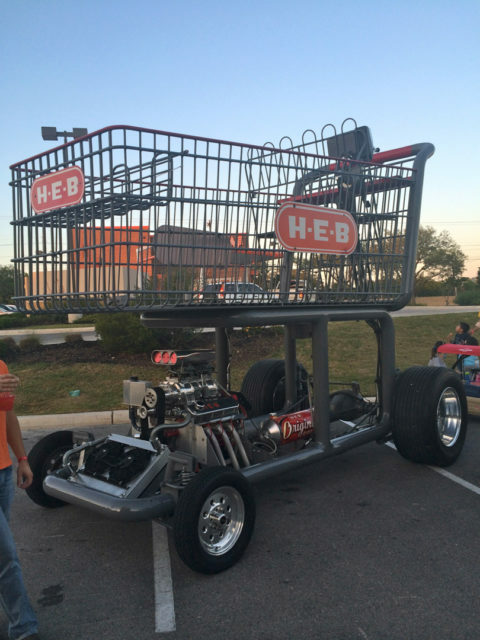 Giant H-E-B shopping cart. Photo by Lindsey Craun. 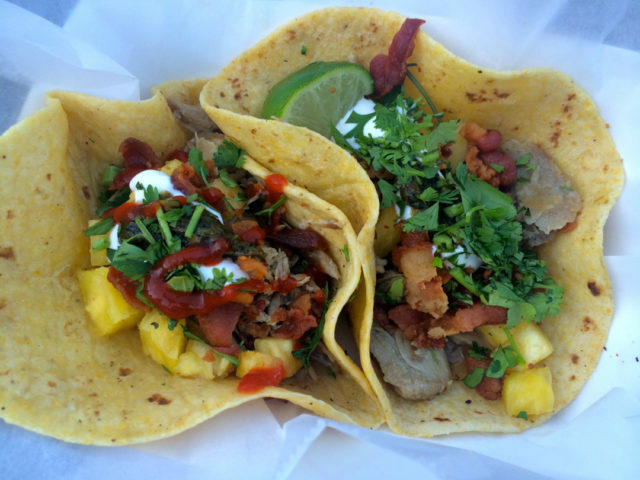 Jason Dady’s Duk Truck serving tacos. Photo by Lindsey Craun. Strolling down the line of trucks, some of the offerings I recognized, others I did not. However, all looked and smelled incredibly appetizing. For the most part, the lines were pretty short. Two in particular seemed especially crowded, so I gravitated toward the long lines for a closer look, and then it all made sense. Their signs read Say She Ate and Duk Truck, two of the better-known trucks in town. I’ve tried Say She Ate’s famous Duck Fat French Fries (worthy of their fame), so figured I should venture out into unchartered territory with Jason Dady’s Duk Truck. Duk Truck offered three different tacos: “Duk,” shredded beef, and “Bomb Mi” with braised pork belly. I went with the classic Duk Tacos, made of duck confit with charred jalapenos, pineapple, lime crema, cilantro and crispy bacon. My order was ready in a minute’s time and they were the prettiest tacos I had ever seen. I took a chance and added Sriracha sauce to one of the two tacos for an added kick. Duk Tacos from Duk Truck. Photo by Lindsey Craun. These tacos tasted as good—if not better—than they looked. All the different flavors worked so well together without being overwhelming. I walked away from Duk Truck very happy with my decision. No buyer’s remorse here. Next, we walked over to the San Antonio classic burger joint, Cheesy Jane’s. My sister ordered a cheeseburger with tater tots and a chocolate milkshake. You can’t go wrong with that combo. There’s a reason Cheesy Jane’s has been around for so long: those milkshakes are the best. 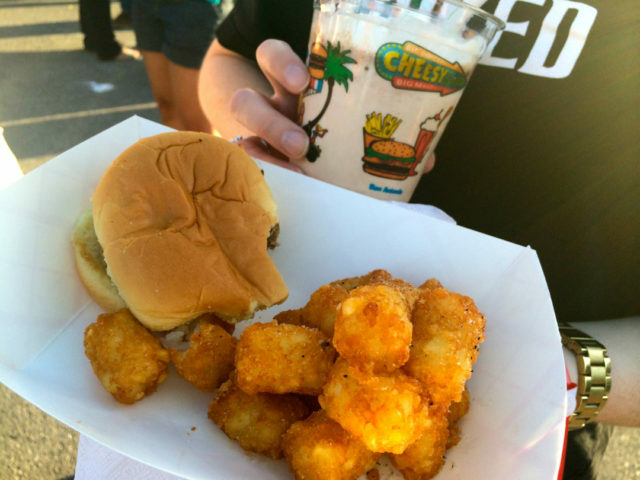 Cheeseburger, tater tots and a milkshake from Cheesy Jane’s. Photo by Lindsey Craun. My friend couldn’t decide which truck to try when I spotted Crazy Carl’s. I’ve never eaten there myself but have heard they serve amazing sliders. She took up my recommendation and ordered their Chipotle Braised Pork Sliders, made of pork shoulder braised with chipotles, oranges, chilies and garlic. 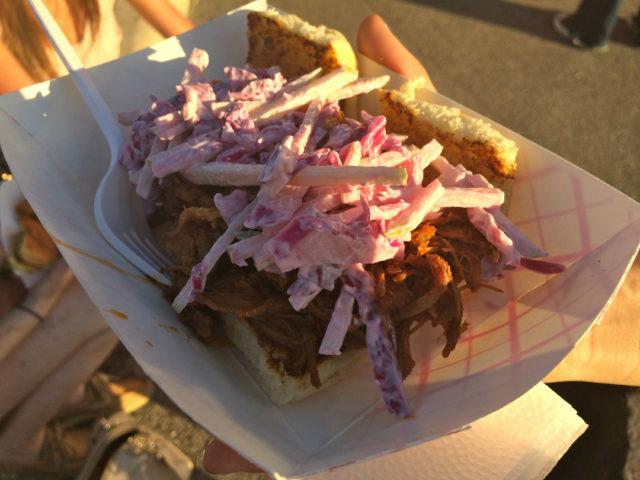 The meat is then shredded and served on a Hawaiian bun with Granny Smith apple and cabbage slaw. The sliders lived up to their reputation—she loved them! Crazy Carl’s Chipotle Braised Pork Sliders. Photo by Lindsey Craun. Once we had finished eating, we walked around the grounds to check out their non-food-related attractions like the petting zoo and a GIANT motorized H-E-B shopping cart. I was amazed. I mean, where do they store that thing?! As the sun began to set, we called it a night. Culinaria Festival Week kicked off to an amazing start. Piglets at the petting zoo. Photo by Lindsey Craun. 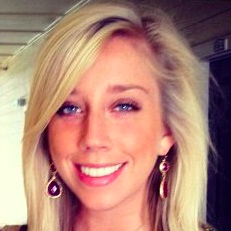 Lindsey is a San Antonio native on a constant hunt for new and noteworthy restaurants, music and nightlife around town.